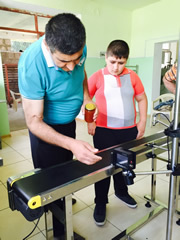 In 2015, JICA Uzbekistan office started implementation of “Mini Grant Projects” program in Armenia. This program is open for all ex-participants of JICA training programs in Japan who are members of JICA Alumni Association of Armenia and in May, the Mini-grant project for 2015 JFY was successfully completed. The first ex-participant which was granted within Mini-grant project was Mr. Vigen Hovhannisyan from Bagratashen village of Tavush region. After conducting of screening process of all mini project proposals Mr. Hovhannisyan’s project proposal “Implementation of quality control system in Viva Fruit: purchasing of Date Code Printer with conveyor” was selected. The project aimed to improve the quality of production, in order to ensure safe use of the product by customers. Mr. Hovhannisyan explains: ‘It is necessary to date the product and to ensure that the customer will use it according to food safety standards. Before purchasing of Date Code Printer, we dated on the package of products and canned olives stamping manually and these marks were easy to delete during the transportation and storage. We are very thankful to JICA for this opportunity’. The project site- Bagratashen village is one of Pilot Sites of “OVOP Armenia Project “. Within this Pilot, Olive processing and Fruit processing has been transferred to villagers, which helped to put out the product in the market. 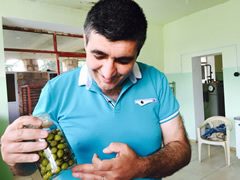 It was noted, that not only Mr. Hovhannisyan and Viva Fuit LLC, but all villagers involved in processing of Olive and Fruit are beneficiaries of this project and believe that only being trusted by the consumer the revenue can be increased. Development of Olive product in Bagratashen village, Tavush Region Processed olive in Bagratashen village is one of important products based upon the Armenian OVOP concept, in the sense that the other villages do not produce it, since most of Armenian territory is not appropriate for olive production in terms of climate.